They were his favorite food — baked beans, great northern beans, navy beans, Lima beans mixed with corn in succotash. The vining bean thrives even in the hottest months and packs more protein and other nutrients than its more common relatives, like pinto and kidney beans. 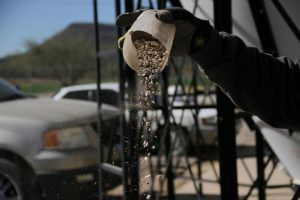 Arizona’s earliest residents grew teparies for thousands of years, but in recent history, the beans were at risk of shriveling into obscurity. Terry Button followed his soon-to-be wife Ramona to Arizona in 1972. The two met in South Dakota, where she was a nurse and he had been traveling with a group that performed at powwows. A friend introduced them because they both spoke the O’odham language. Ramona Button grew up near Sacaton on the Gila River Indian Community, the daughter of Tohono O’odham and Akimel O’odham parents. When she was 9 years old, her father started to teach her how he farmed their family’s 10 acres. They grew chiles, squash, eggplants, watermelons, tomatoes, corn and tepary beans. The tepary beans come in a spectrum of colors — white, brown, black and speckled blue like robin’s eggs. “My father said everything that I’m growing today, it might not exist unless somebody brings it back in,” Ramona Button remembers. He stashed away beans in a chest, and after he died, Ramona and Terry Button began to grow them alongside the cash crops like wheat and barley. Terry Button joined farm industry groups and began to learn about the factors that shape how food is sold. “The situation that we find ourselves in is a result of unintended consequences of development around the reservation,” Terry Button said. The number of native farmers was shrinking and the proliferation of big-box grocery stores hurt the market for traditional foods. “We had no connection with the market. We had no way to get the food to the people,” Terry Button said. Today, we might have referred to the tepary bean in the 1970s as an “endangered” crop. That’s how farmer, scientist and tepary bean evangelist Gary Paul Nabhan describes them. Nabhan lives outside Patagonia, Arizona, not far from where he first saw the beans in the wild. Nabhan began researching the beans for a University of Arizona thesis and, in the process, ended up eating and selling them to make ends meet as a grad student. He thinks the beans are more than a cultural relic. Nabhan believes the drought-tolerant teparies could become a solution for growing food in a hotter and drier Arizona. Traditionally, the Tohono O’odham grow teparies on monsoon rains alone. 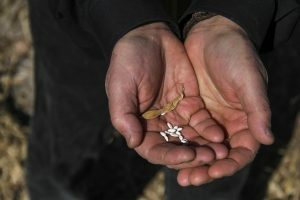 “I think we’re going to see agriculture of the future looking much more in harmony with the desert rather than always being in struggle with a desert existence,” Nabhan said. 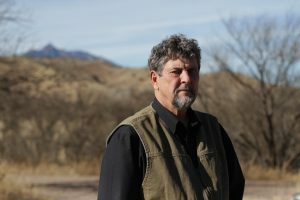 “I sort of feel like I owe the little bean some kind of debt,” says Gary Nabhan, because of how the legume connected him to the people and places of Arizona. Nabhan co-founded Tucson non-profit Native Seeds/SEARCH in 1983 to solidify his work to preserve seeds native to the Southwest. “We are preserving the 4,000-year-old history of the greater Southwest,” said Nicholas Garber, conservation program manager for the nonprofit. His desk is covered in papers, books, plastic containers of corn kernels donated by a Hopi farmer, and a snack-sized bag of Hot Cheetos — the enemy. “I really do feel like the work we’re doing with the collection is to replace these industrial foods,” Garber said. Native Seeds/SEARCH sells seeds, distributes them to schools and provides free seeds to anyone who identifies as Native American. The organization maintains almost 2,000 types of seeds in a storage refrigerator sourced from farmers around the Southwest. Tepary beans take up two shelves of industrial shelving in the 40-degree room. The earliest wild tepary beans had fragile pods that shattered easily, flinging small pebble-like beans far and wide — not ideal for harvesting. Over the years, indigenous people cultivated the beans to have sturdier pods and larger beans. They remained disease-, drought- and heat- tolerant. “It actually needs the stress of having water deprived from it to flower and fruit,” Garber said. Scientists are exploring how these traits could be passed onto more common beans. The demand for tepary beans is now growing outside native communities. Ramona Farms reports it distributes products to more than 50 restaurants and shops, from Whole Foods Markets to restaurants such as Tucson’s Welcome Diner. Recipes online include tepary beans in hummus, stews and salads. The “Three Sisters Burrito” at Welcome Diner is inspired by the crops that have grown in Arizona for thousands of years. “We got our nice hot tortilla, our butternut squash is nice and crispy,” said executive chef Michael Babcock, as he scooped tepary beans and corn onto a burrito. Together these three sisters, as they’re called, were the basis for agriculture in Arizona. The beans in the burrito are virtually unchanged from those Ramona and Terry Button pulled from her dad’s saved seeds all those years ago. Babcock said the idea was to create a menu that highlights local purveyors, from coffee roasters to farmers. “As a chef, our jobs are to share culture and to share ingredients,” Babcock said. “And we just want people to feel like they’re connected with the land that they live in. The Buttons still have to grow thousands of acres of cotton, alfalfa and other cash crops to afford to grow 100 acres of teparies a year. They also cultivate native varieties of garbanzo beans, corn and wheat. “The only way we’re going to be able to enjoy the ability to continue to grow them is if we can make money doing it,” Terry Button said. Terry and Ramona Button’s daughter, Velvet Button, works with her parents to reteach people in the Gila River Indian Community how to cook native foods. Brown tepary beans are high in fiber, protein, iron and calcium. They’re low on the glycemic index, which means the carbohydrates digest slowly. This is especially important for people with diabetes, who need to carefully monitor their blood glucose. “If we want to change our health, our connection with our spirituality and our food, we have to put it on our everyday tables,” Velvet Button said. Terry Button hopes that if the market continues to expand on and off the reservations, it will create economic opportunities. After growing up on the Tohono O’odham Reservation near Tucson, Gabriel Mendoza was living there for the first time in a decade when he started to learn about agriculture. “Growing up, I kind of already had an idea of what traditional food was, but come to find out that everything that I had known for so long and thought was traditional food was not traditional food,” Mendoza said. He had associated tradition with foods such as potato salad and fry bread. Not long after moving back home, Mendoza started an apprenticeship at the nonprofit Tohono O’odham Community Action after they knocked on his door looking for volunteers to help with a community festival. He hauled bags of tepary beans for a giveaway and gleaned corn from the fields. Eventually he completed an internship with the group, where he was immersed in agriculture. He can see the image of beans in an old mayonnaise jar on the the shelf of his grandmother’s home, and squash in the garden of relatives.